I’m excited to share with you one more place in my home that I spiffed up for fall and that’s my mantel and fireplace. I love playing with our fireplace and have filled it up with everything that says fall to me! 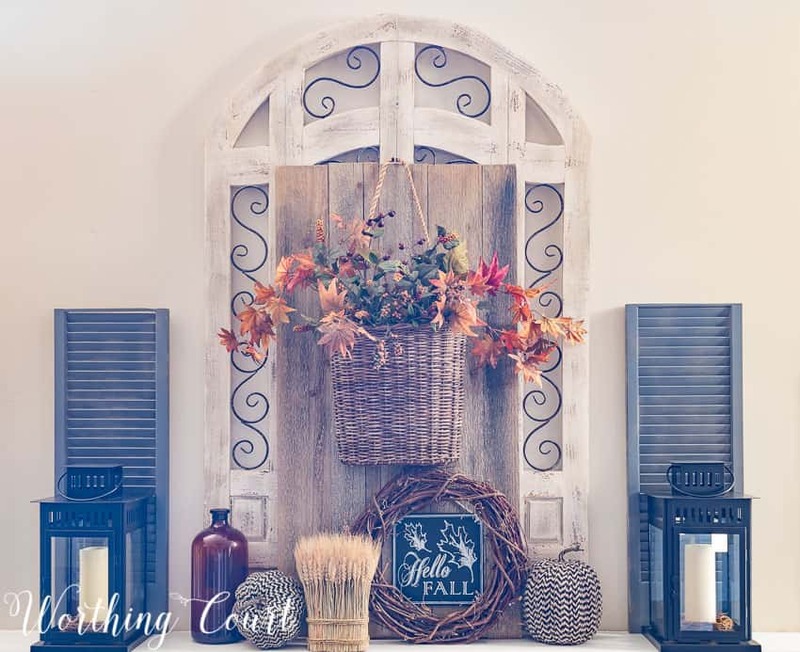 In keeping with my KISS method of decorating, I kept the faux arched gate piece and shutters and just changed out what is displayed around them. 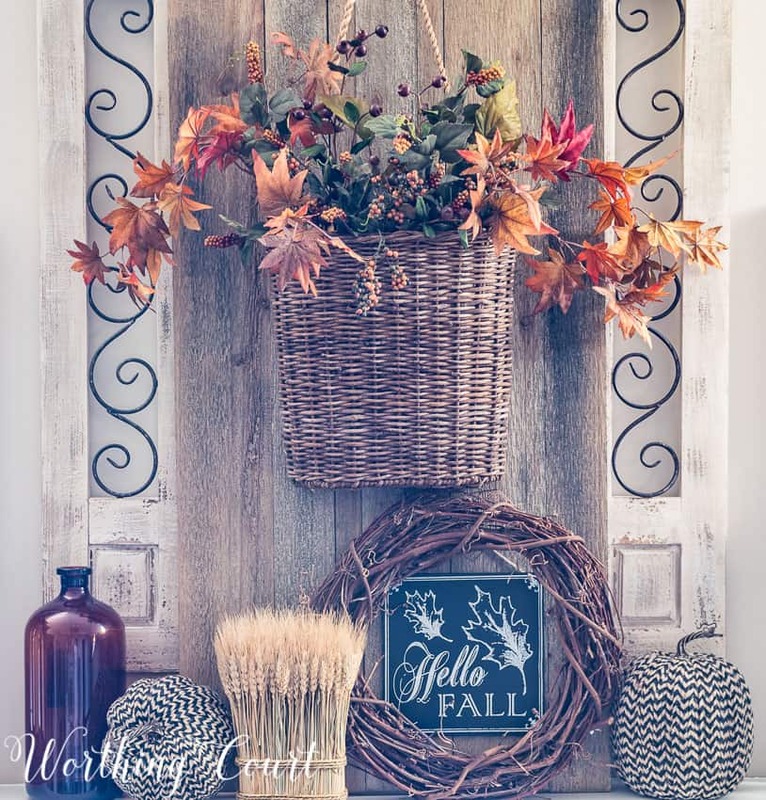 Instead of hanging a wreath directly from the faux gate like I normally do, I leaned my diy aged barn boards against it and added a hanging basket filled with a few fall branches from my stash. I love the show that Mother Nature puts on in the fall with all of her vibrant colors and just can’t resist using them inside my home! Instead of bright pumpkin orange, I’ve embraced all of the rich russet colors. And texture – texture is everywhere! 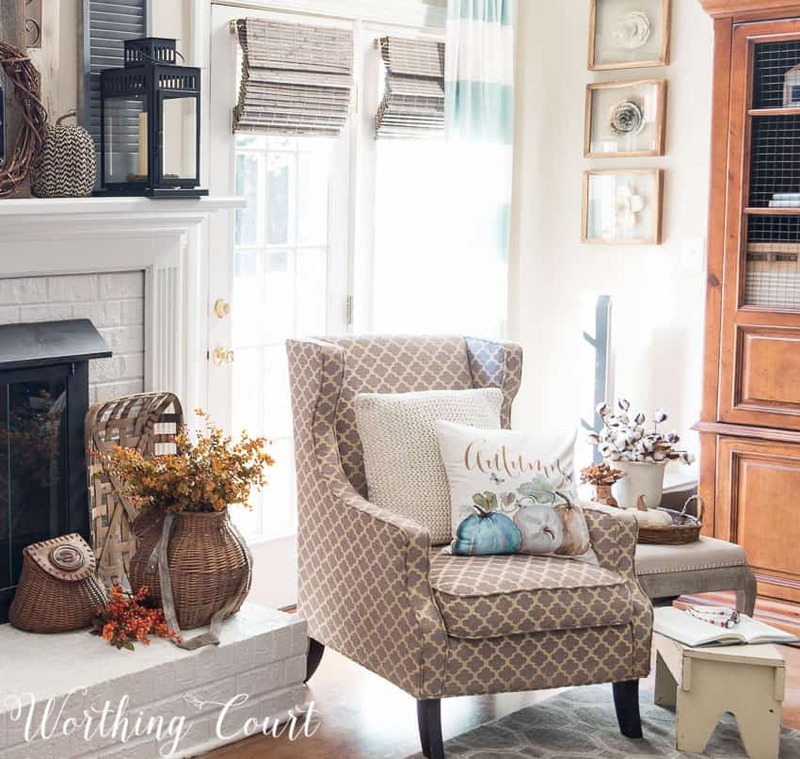 The chairs that flank either side of the fireplace are all cozied up and ready for cooler fall temps. Summer is being slow to let go this year. Right now we’re still in the 90’s every day here in NC, so it seems like those wonderful chilly nights will never arrive! An old wood crate makes the perfect spot for a lantern filled with acorns and a fall candle. And the bright sunshine that comes through these doors makes a perfect spot for curling up with a book. I love to read – do you? 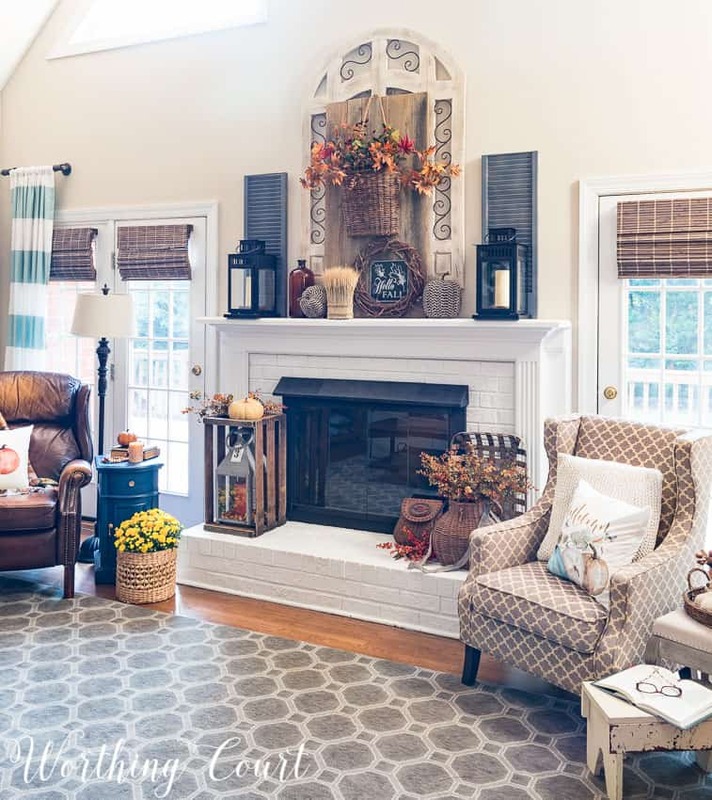 I’m honored to be sharing my fall mantel with you today along with seven other super talented ladies! 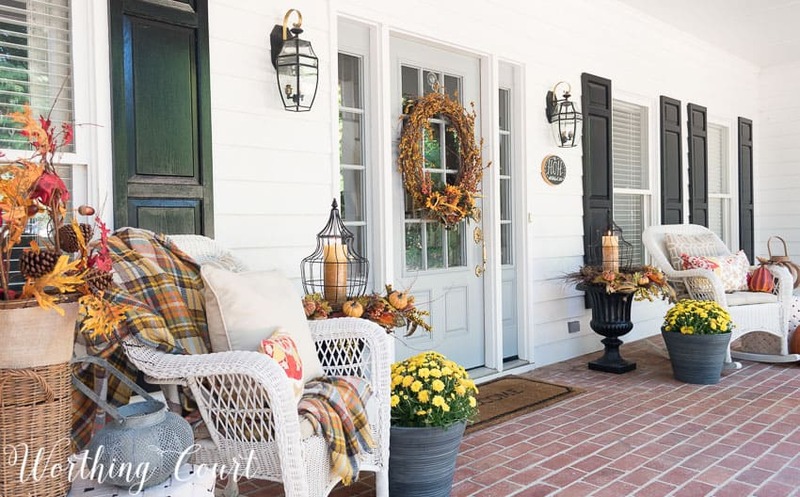 You’ll want to click on each of the links below to see how they’ve decorated for fall in their own homes. So much inspiration! Your home is just so cozy and I just love your family room. Funny, when I saw your brown chair looking so inviting, my first thought was, wish I could curl up there and read the book I got yesterday. Then I scrolled down and that is exactly what you said! I like the idea of using rustic colors. Your talent just shines through. Love it ! I just bought a new lantern and wasn’t sure how I would add it to my fall decor – now I know , I’m going to fill the bottom with acorns and add it to the mantel. You always have such beautiful and great ideas. I just love all of your baskets – so beautiful and textural…they add such a wonderful dimension to your fall look. I’m sorry to hear how hot it still is for you. We had a hot summer (for us) here in Michigan and I don’t even know how to cope with such humidity – it was miserable! I’m praying you find relief soon and can have some beautiful fall weather. I love to read, too, and there’s nothing like a cozy chair to curl up in with a good book. (I have the same chair but mine is burgundy leather – it’s so comfortable and I love it’s lines). Your fireplace is beautiful!!! I love how you kept the gate piece and shutters and just decorated around them. Love your blog! I like your faux arched gate above the fireplace. I also like your fall colors in your home. Such a wonderful time of the year. Great style and techniques. It is very welcoming. You can really feel fall is in the air. Love the tips! Thanks a bunch! So beautiful! I love everything and I’m so excited to have discovered your amazing blog! Can’t wait to read all these fun posts and be inspired. Well, being in the hospital with hubby for a week now I love to see something besides white plain walls, etc. This looks lovely and encourages me to do this with some of your arranging ideas. Great job! Hi! I just love all the ideas in your blogs. It really inspires me to get going on my Fall decorating! You are very creative! I was wondering where you got your “autumn” pumpkin pillow, pictured? It’s very unique and different from most of the other ones I see at the stores. Thanks! I love the beauty of the light/white backdrop for your fall touches! My family room is dark and I have found ways to brighten it up with your post! The old barnwood plank for the ‘wreath’ effect is awesome! Thanks! Love your mantel! Those lanterns are amazing! We just completed our our fireplace after living in our home two years and I’m so excited to decorate it for the different seasons, this give me lots of inspiration! You have such a cozy and inviting space! 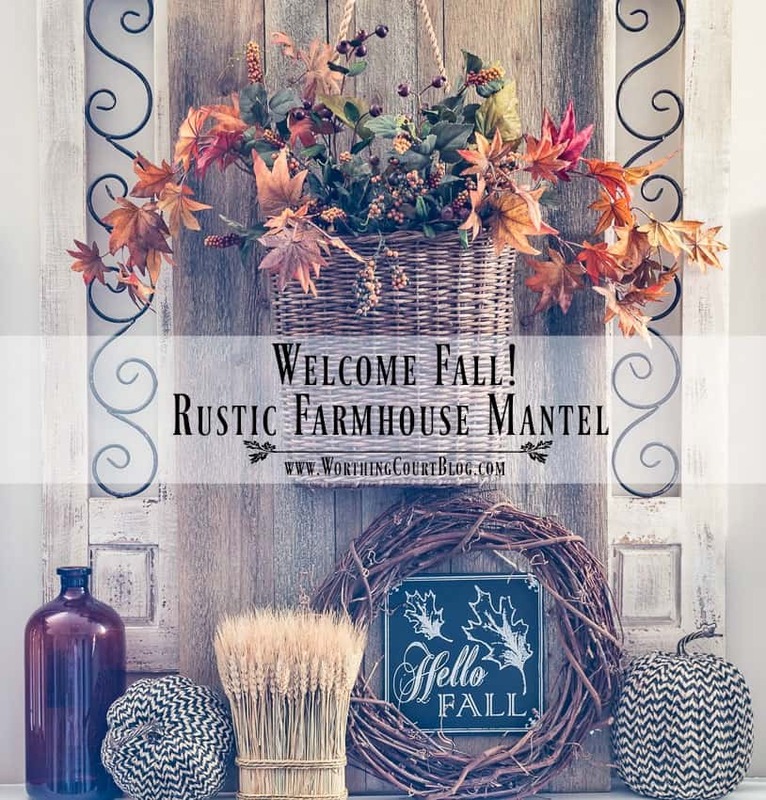 I love all the fall colors and texture from the barn wood and baskets. Everything is gorgeous!! Fall is barely peeking in here in So. Cal. Your porch has put me in the mood and I’m busy trying to change my look. Thanks for all the ideas. 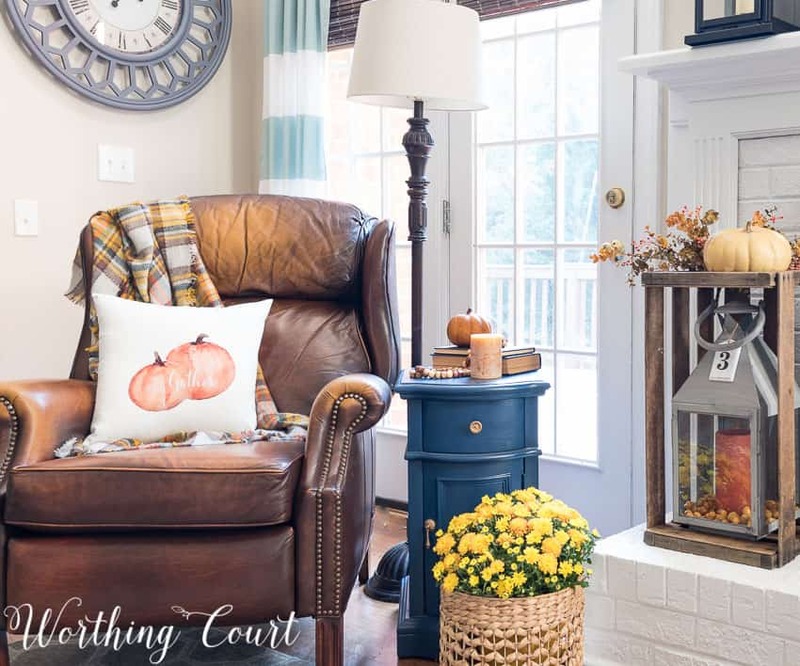 Love all the fall decorating ideas! Beautiful display! Yes, the texture is wonderful. Where did you purchase the hanging basket that’s mounted on the aged barn wood? I would love to have one for my entryway. Thanks for any shopping tips you can offer on this item. Suzy, so far behind and I have been loving your fall touches throughout your home. The fireplace I amazing especially the hearth with the crate and the mix of baskets. I just crawled into these pictures!! I LOVE what you’ve done with the mantel and your home in general. How blessed you are! 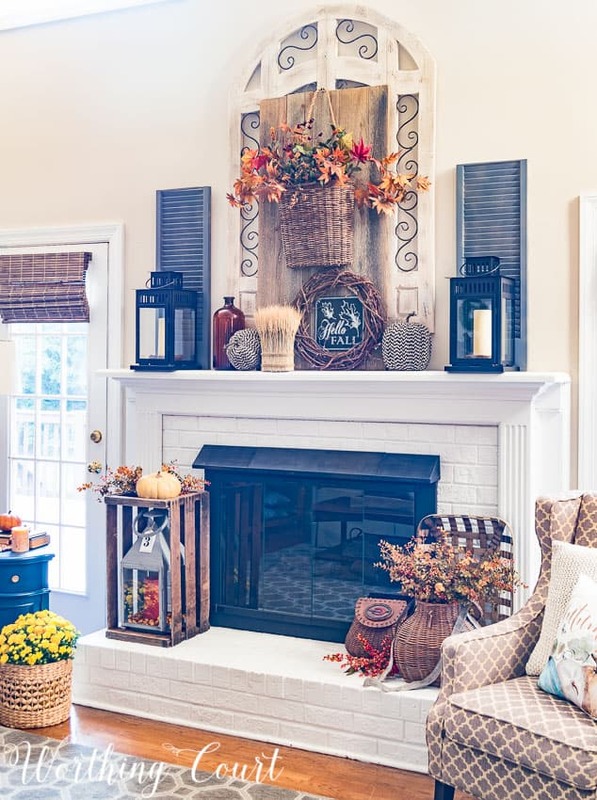 What a beautifully decorated Fall mantel. I love how you brought in the natural elements. Thanks for linking up with us at the #HomeMattersParty this week. Your living area is very warm and welcoming. I especially like the pillows by Craftberry Bush. 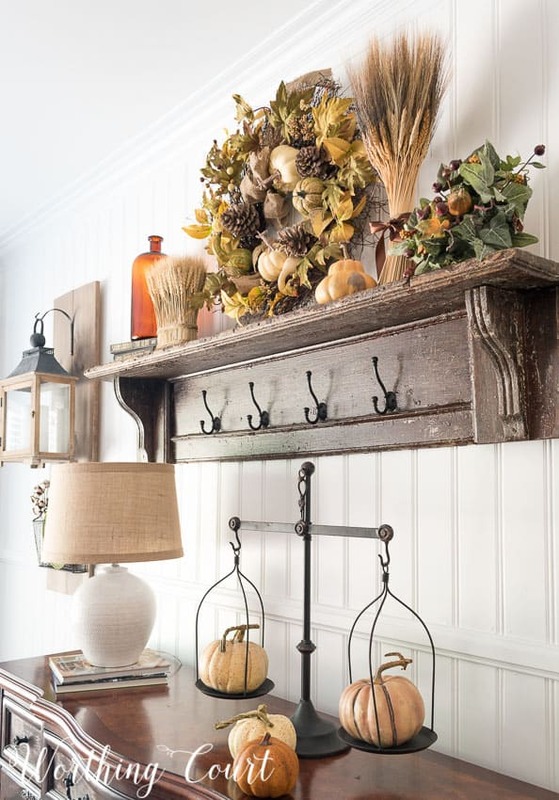 Love all the great fall decorating inspiration!! I always look forward to seeing the seasons change in your lovely, welcoming space. I would love to purchase/create the black and white herringbone patterned pumpkins on your mantle, any suggestions? Hi Lisa. Those black and white herringbone pumpkins came from Target last year, but they aren’t available anymore. 🙁 If you’re crafty, you could use ModPodge to cover a faux pumpkin with similar fabric. Just a thought…. Everything about your home is just so beautiful. You’ve got such a delightful way of introducing Thursday!! Fall is my favorite time of year and I love the way in which you celebrate the season! No bright oranges; just warm russets! That was music to my “eyes” when I read that! Orange is just so, so, but I, like you, would rather use the cozier more comfortable hues of autumn. We live in a small, yet lovely apartment that is unfortunately missing a fireplace; thus no real mantel! I’ve tried to compensate by putting up some beautiful wooden shelves my Dear Father made and they look great! However, they lack the depth and length needed to decorate them as you do your mantel. So, here’s where Miss Creativity comes into play! Of course, this is not a hardship as there’s nothing more I’d rather do with my time! The small white pumpkins may find a way in and perhaps a homemade mint green, burlap, leaf banner! The small pumpkins are my preferred choice as my space is limited. My FALL box is in our storage compartment so I need to wait for my Sweetheart to get it out for me! There’s an abundance of fall treasure just waiting to be found again! Your blog is wonderful! It’s extremely entertaining and helpful so thank you for your efforts in getting it all put together so beautifully! Til next time! Happy Early Fall! Lucy! Hi Lucy. I’m so glad to hear the you’re enjoying the blog! I love your plans for using white pumpkins, mint green and burlap this fall – it sounds very pretty!